Elisa is not the type of girl you notice. She stays out of sight and keeps a low profile. But her way with words makes her useful to lovelorn boys who take the love poems she ghostwrites for them to win the hearts of their girlfriends. But one of her clients (Theo) is special and different, and the poems she writes for him to give to his Lila mean more to her than they could ever mean to Lila or Theo. More inspired by Cyrano de Bergerac than copied, this lyrical love story celebrates the strength to rise out of the shadows and seize the day. 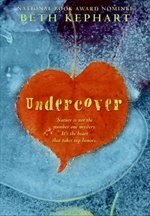 Beautifully written, albeit prone to more than a few digressions, this is a strong YA debut from an author who carved out her credentials in the adult market. There are times when this novel drifts away from the YA world, but Kephart shows much more talent than your usual crossover author. Recommended. I love this review, and I thank you for it. Wishing you an autumn of wonderful books.